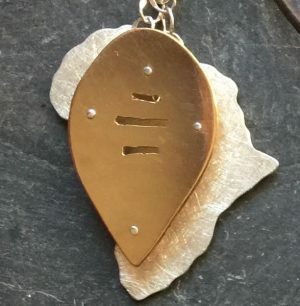 A lovely perfect miniature African warrior/dancer shield in sterling 935 silver and gold overlays a matt Argentium 935 sterling silver Africa shape. 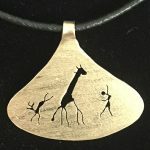 Total size is approx 2″ x 1.5″ (5 x 2.cm). 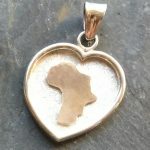 Each pendant is made from Argentium 935 sterling silver and 20/14KY gold fill in different layers to portray some feature with Africa. 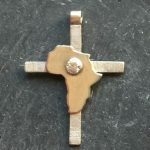 This one features a larger warrior gold fill shield over a brushed silver Africa. 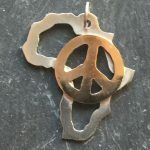 African rangers often still carry shields for protection from animals and warring tribes, but mostly as part of their “dance uniform” for ceremonial occasions. NOTE: Has no bale. Designed to work as a slider, so thread your cord or chain under top rivet which has a rotatable sleeve.